The foul wind that blew behind the ships caused them to move forward through the water but the movement could in no way be described as beautiful. The biggest of the ships lurched forward through waves. It smashed through the water. The ship had once been designed to move more gracefully through the water but now the rotten boards did not fit together correctly, stinking fluids poured through the open cracks in the ship and it was only the pressure of this continual oozing that kept the ocean waters out. Their movement was like an assault on the water itself. 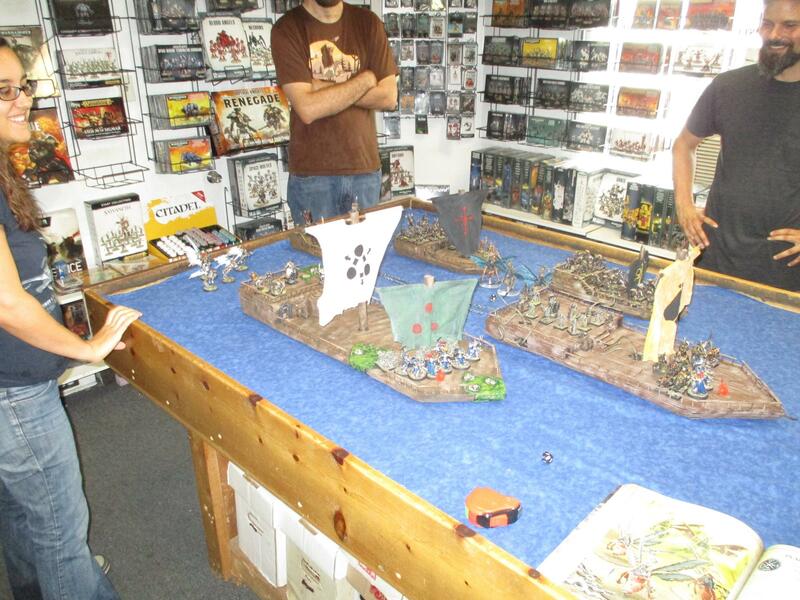 Behind the helm of his flag ship Carcingetorix looked out over the coast line getting larger before him. He could just make out the mouth of the river that was his destination. The sun beat down on the decks of the ships and the blistered skin of his men withered in the light. A braying could be heard from the ships containing his Beastmen allies even over the throaty warbling song that came out of the mouths of his men. Suddenly and from no where though storm clouds gathered overhead. Only briefly did Carcingetorix consider this a blessing, a relief from the sun. He knew they were too close to the land now for a storm to seriously trouble their passage, at least a normal storm. In less than a minute though he realized this was no normal storm and he yelled to his men to be ready. His warning came too late. With three quick flashes of lightning the Sigmarites were there. The massive bows of the ones on the prow of his ship and the ship to his port side were already bent when they landed. Far off to the port side the glimmer of light showed him where some of the damned flying warriors were attacking the Beastman ships. Soon arrows were falling among his men. The bows of the Stormcasts were like wheels they reloaded and fired so quickly. Soon the decks were cleared of the sailors of both boats, those not successful in seeking shelter below decks being killed. On the flag ship there was no shelter below deck and the men who fled their instinctively were swallowed up in the contagious fluids that were leaking from ever part of the inside of the ship. Carcingetorix nodded his head and out of every hole big enough to sprout them poured forth a gibbering, chanting horde of nurglings. They took up the song that the men had left off singing when the Sigmarites attacked. Their shrill voices sounded out and drowned out the curses of the Eternals as the small daemons swarmed over the shinning warriors, besmirching their armour. Using hammer and short sword the two units of warriors tried to fight off the virulent tide but it was impossible. Cancingetorix laughter echoed out of his full face mask and he did not even send his body guard forward to deal with the threat as only the occasional glint of steel could now been seen under the mass of nurglings. 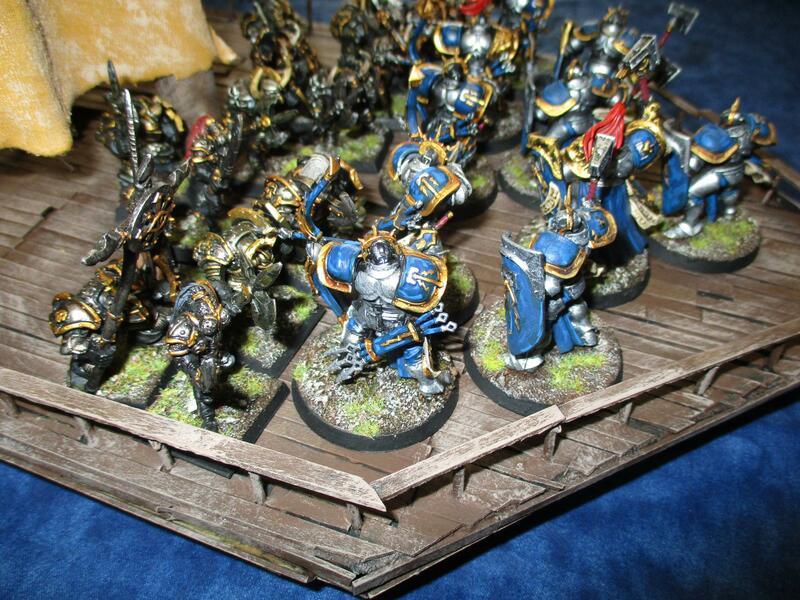 He trained his attention on his other plague ship, where he saw his warriors mover forward into a line. Their lurching gait belied their discipline and soon the warriors were hacking at the Sigmarites cutting down enemy warriors and forcing the invaders back. Soon the ship was cleared of the enemy. More flashes of light appeared, this time behind Carcingetorix. 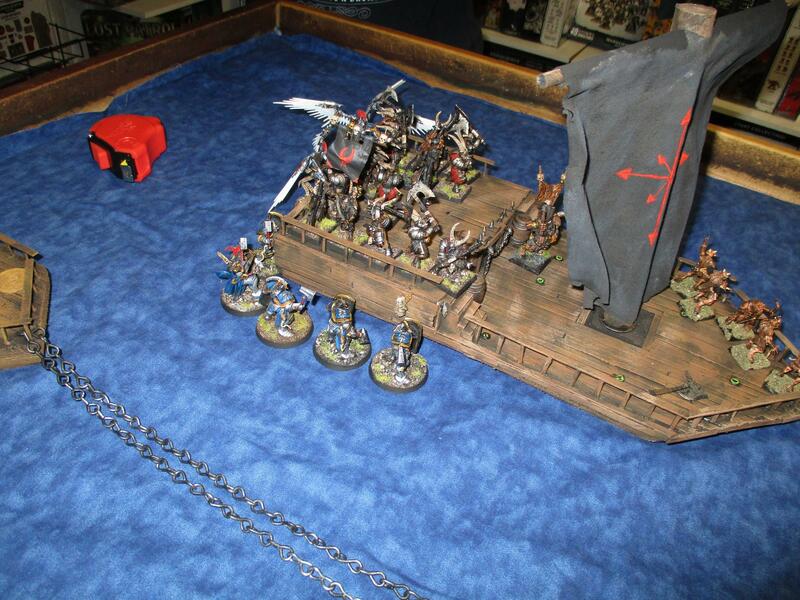 The ship to his port was towing a small barque with the weakest of the beastmen in it. 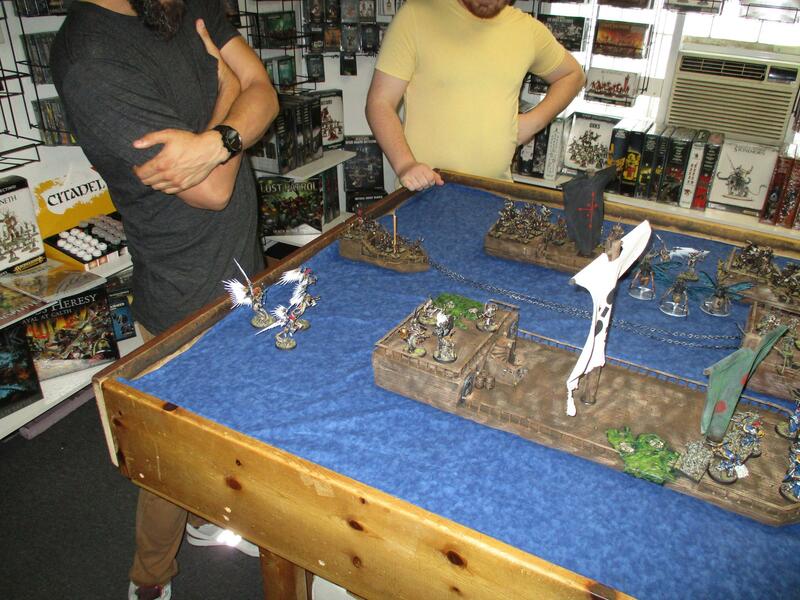 This, now, was the target of the Stormhosts wrath and gleaming armoured angels fell on it from all sides. 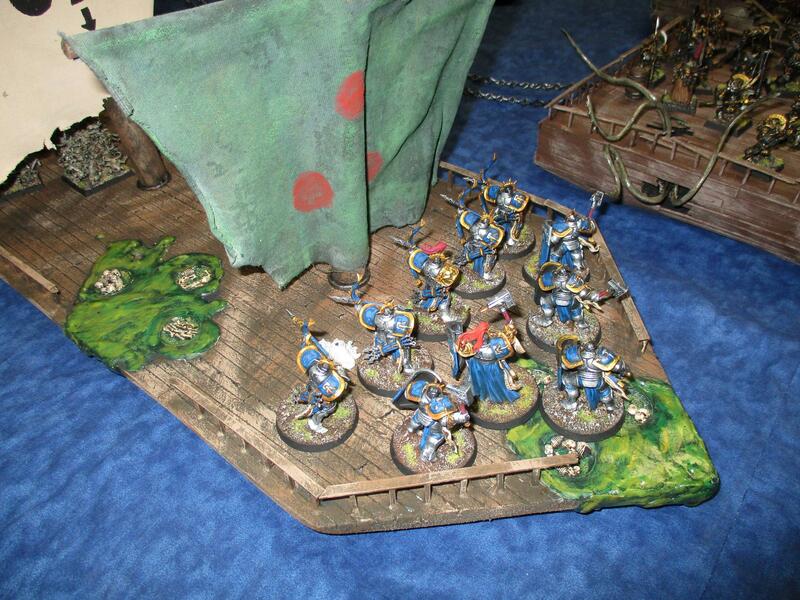 Quickly the ungors lay shattered on the deck or abandoned the ship to take their chances in the water. 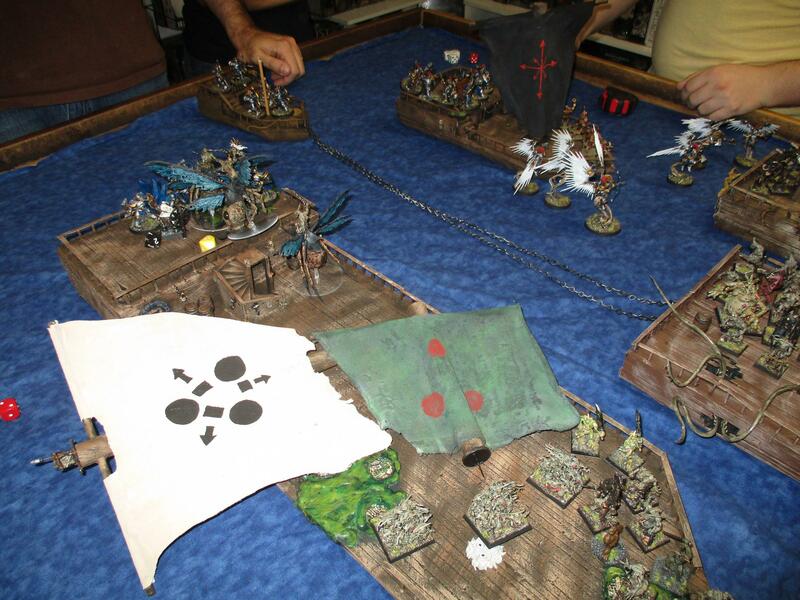 More flashes of lightning saw the ship covered with armoured warriors and as the Prosecutors flew away from the ship, the Eternals moved the rudder of the towed ship pushing it towards Carcingetorix and his flag ship. 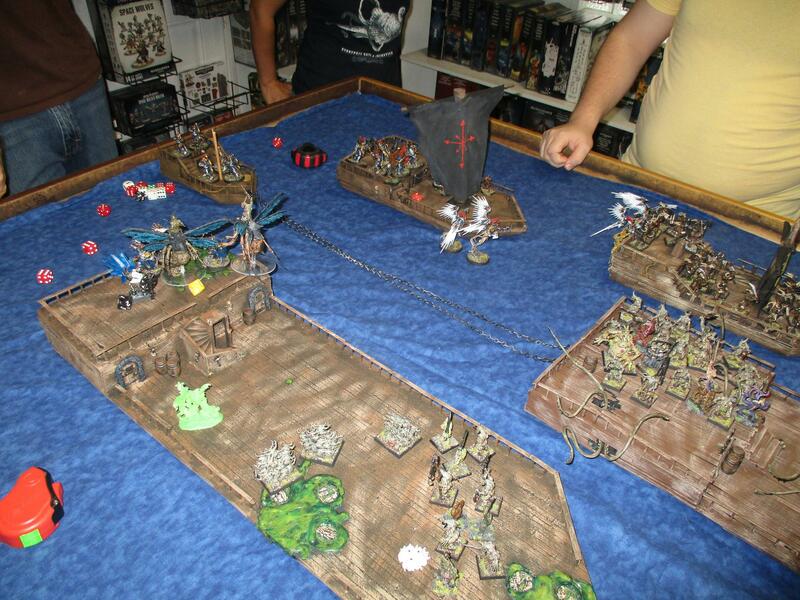 The Plague Lord started to yell for the warriors in his next ship to cut the chains that held the boat in tow. 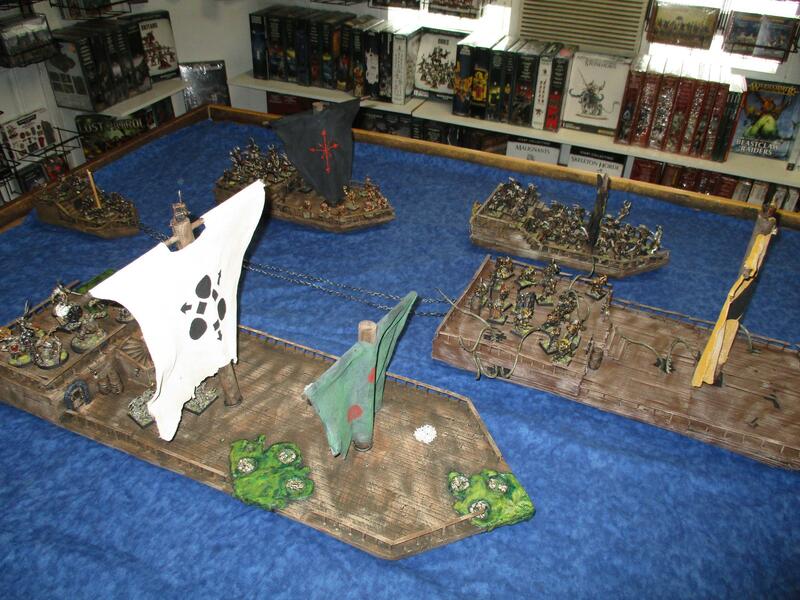 His command was cut short as the armoured warriors leapt on board his flag ship. The Sigmarites moved their weapons so quickly that the glaives seemed like gleaming circles as they cut through the Blightking bodyguard. The fight became general and spilled from the weather deck onto the main deck with might blows exchanged by both sides. Too late did Carcingetorix realize that his men were not the main goal of the Stormcast Eternals. Their blades bit through the ropes holding the sails in place. 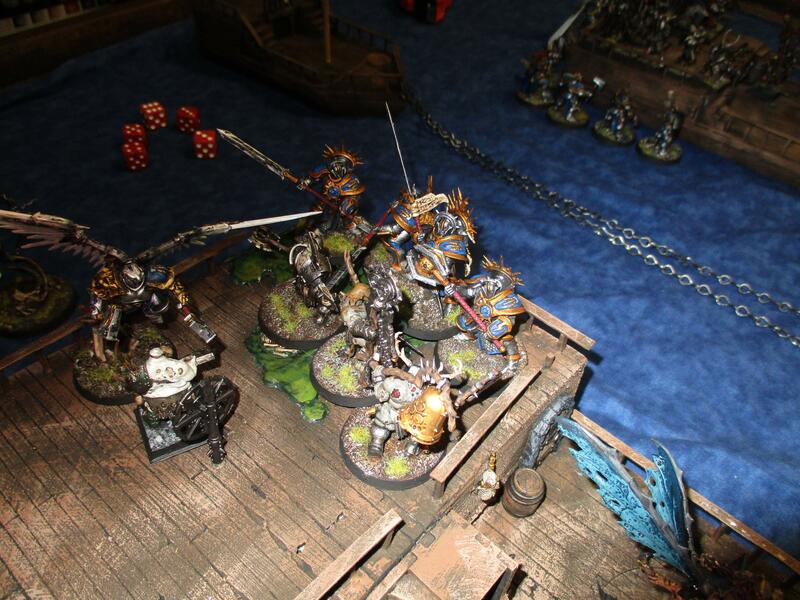 Even seeming misses by the Protectors were aiding Sigmar's cause. The rotting cloth fluttered in the wind, no longer taut the ship started slowing almost immediately. 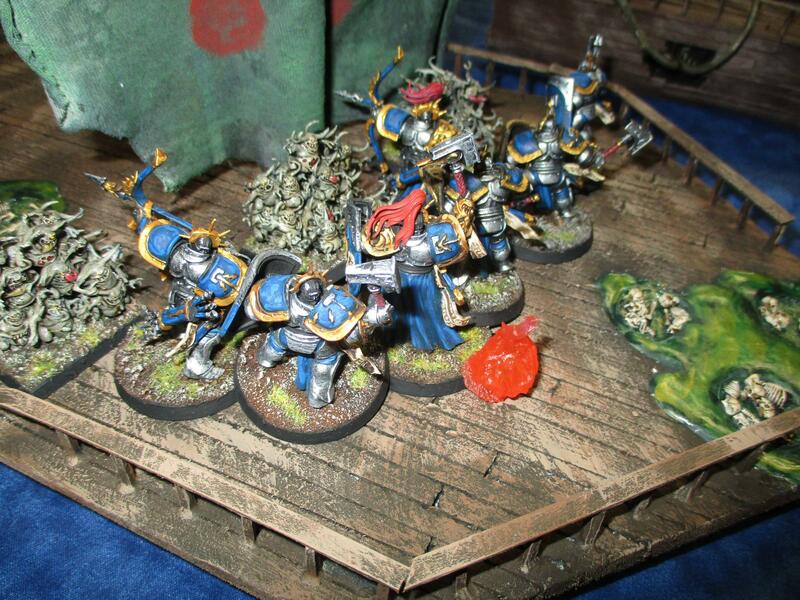 Bellowing in rage the Nurgle commander buried his axe in one of the warriors, shattering the armour of the Sigmarite. 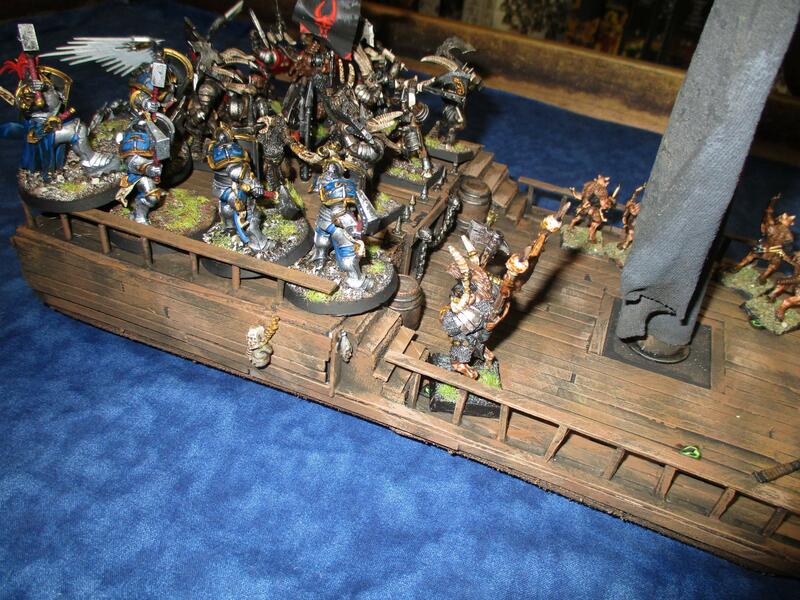 He looked around at the other ships and saw the steel forms swarming over the back of one of the Beastmen ships. Bestigor bodies went flying off the sides of the boat and were battered to the ground as the brownish mass that had been at the rear of the ship was now replaced with a gleaming metal one. The Beastlord Kharos sprang up the stairs to face the force that had slaughtered his bodyguard and, although he was able to injure one of the warriors he was quickly dispatched himself and the Plague Lord saw his massive furred form drop into the water. Hard pressed, he was falling back from the helm when he heard a buzzing over the sound of metal on metal. 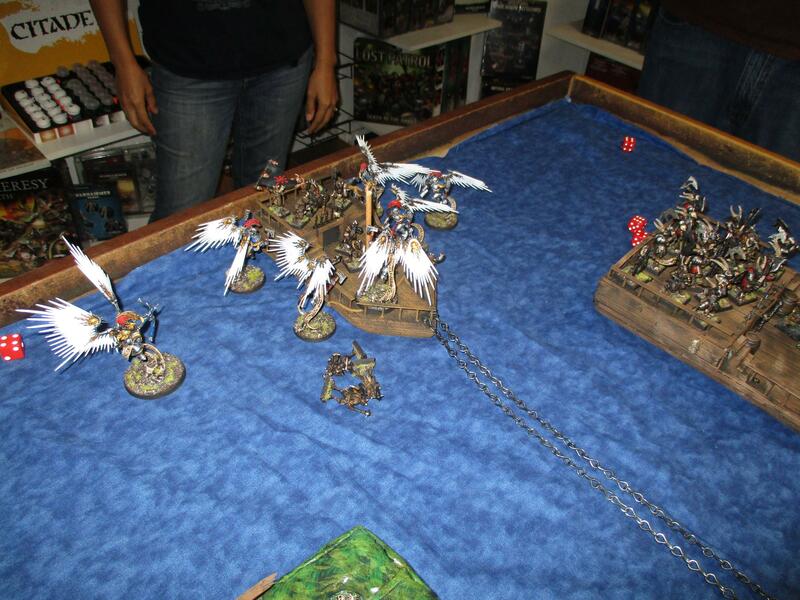 The daemon flies interposed themselves between him and his enemies, giving him a chance to look at the overall situation. 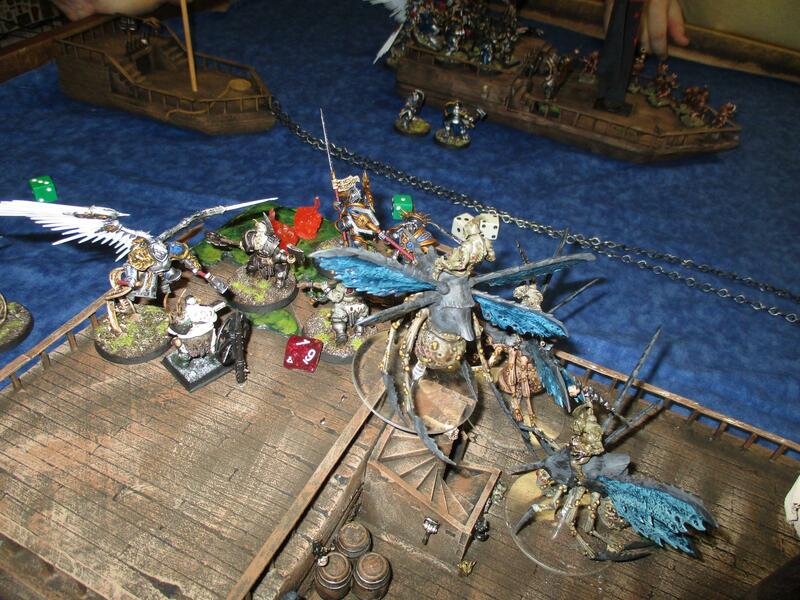 His face mask again muffled his shout, this time of glee as he realized it was too late for the forces of Sigmar. He could see the two remaining ships passing into the mouth of the river even as the momentum of his ship had left it and he drifted. They were clear of enemy impediments. Soon the Living City would ground zero for a host of the most virulent diseases to ravage an unsuspecting population. Wow! That looks amazing. I wish I could have played in that. How anyone can hate a game that inspires things like this is confusing to me.